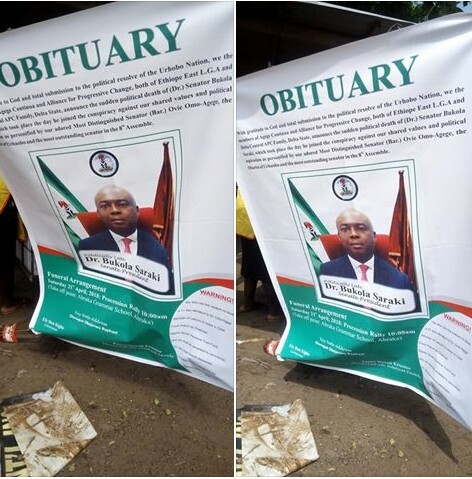 An obituary banner was designed for the ”burial” of Senate president, Bukola Saraki over the suspension of senator Ovie Omo-Agege representing Delta Central at the National Assembly. The banner which was purportedly designed by some of his constituents in Delta state was done to announce the political death of the Senate president for ”conspiring” against their lawmaker to suspend him as they held a ‘burial’ for him (Saraki) a few days ago in Abraka. Meanwhile, contrary to belief in some quarters that Senator Ovie Omo-Agege was suspended over his opposition to the election reordering bill, Senate President, Dr Bukola Saraki, has said the senator representing Delta Central was sanctioned for taking the Senate to court. Taking the Senate to court, according to Saraki, smacks of gross indiscipline, which should not be condoned by the upper chamber. Omo-Agege, who was billed to appear before the Senate Committee on Ethics, Privileges and Public Petitions over his comments on the amendment of Electoral Act, 2018, had sued the Senate in a bid to stop his appearance.